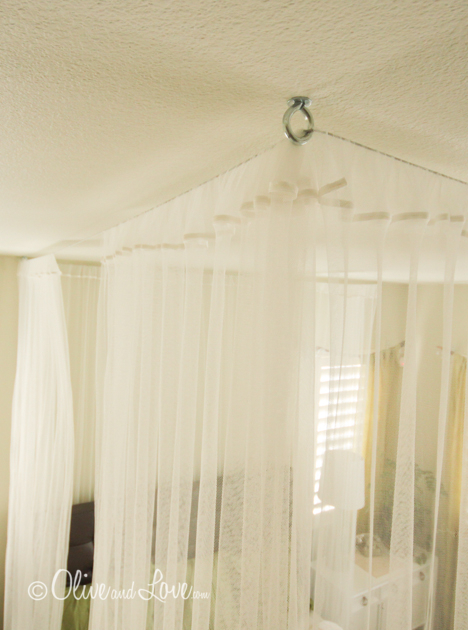 My ceiling mounted bed canopy consisting of eyebolts, turn buckles and wire thread through sheer curtains from Ikea. Once I gave up the down rod idea, the construction was fairly simple. Four eye bolts threaded through washers are screwed into predrilled holes in the ceiling. We drilled the holes six inches wider then the perimeter of our bed and one foot longer. 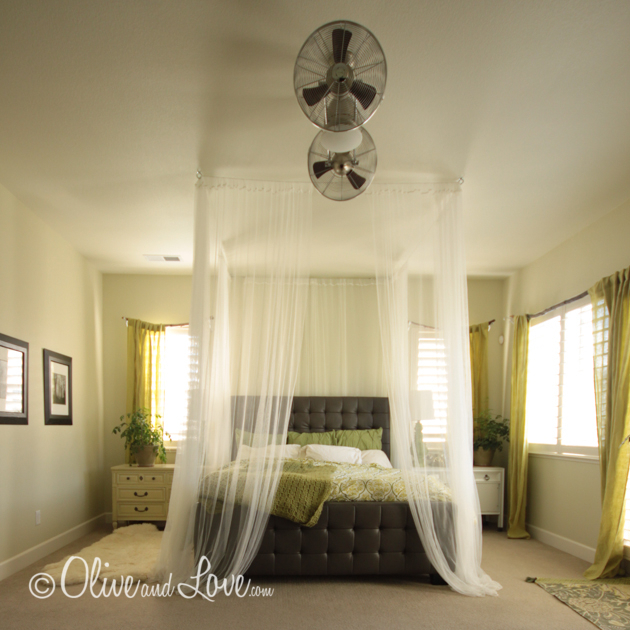 We didn't have our dream frame yet, nor had I dreamt it so we hoped the size would accommodate our needs. Update: We're golden. The West Elm bed fit perfectly in the spot. Dan my man crawled into our ceiling to thread a washer and bolt on to the end of each eye hook. 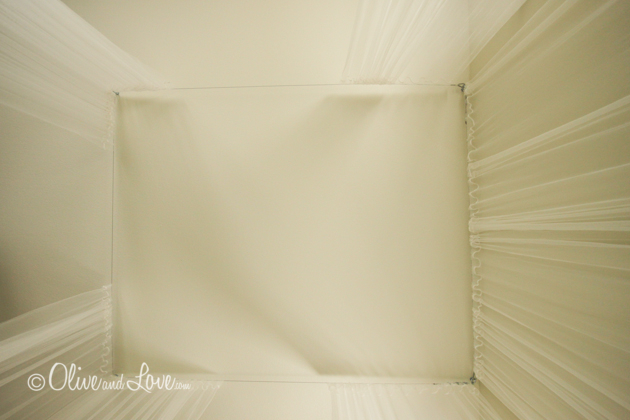 Our bolts go through dry wall only, so swinging is NOT recommended...it would be more like 50 shades of falling if we tried. We have two wires that hold the curtains. Both are 3/32 wire rope available at your local hardware store. 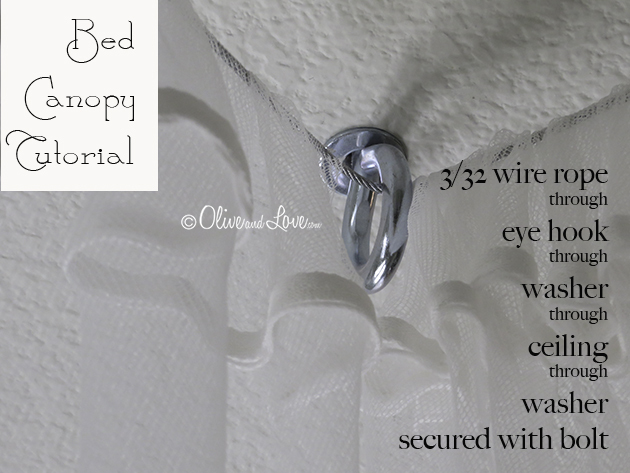 One stretches between the two eye hooks along the back wall and the other stretches around the sides and foot of the bed. The beginning of the wire is threaded through a double ferrule, then through the first eye hook and then back through the double ferrule and crimped very carefully using bolt cutters. The correct tool for this is a couple hundred dollars but a bold cutter works just fine. We also threaded the wire through a thimble where it curves back through the eyebolt for an even (yet unnecessary) finish. The wire is then thread through two curtains, then through another eyebolt, then two curtains, another eyebolt and then two more curtains. The final connection to the eyebolt consists of a 3/8” turnbuckle and another thimble (for an even finish around the eye bolt). This makes it possible to tighten the wire rope enough to not sag. Careful not to over tighten. 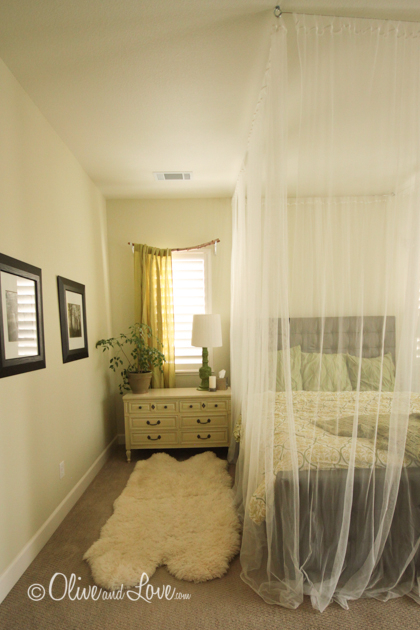 I used the cheap sheers from IKEA. However they were two short after I changed the architectural design and so I very carefully seam ripped the rod hem, turned the curtains on their side and re-stitched them into place which added a couple feet to the length. Not a big deal but a bit time consuming since I did this times eight.